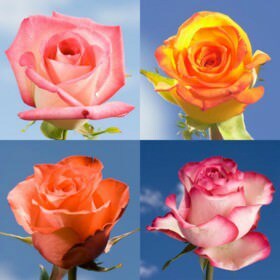 Multi Color Roses have the same quality that fine dishes in cooking have, layers of intricacy that harmonize together — the result is a deep appreciation of their excellence. On This Category Boxes come with one or more shades of buds. They are for those times where you want to say something big and meaningful, they are intriguing and beg for you to take a second look and examine their delicate distribution of color. For a striking display, choose them to add a regal and exotic flavor at a wedding, anniversary, or birthday celebration. These blossoms are true raconteurs, a story with a beginning, middle, and ending, they speak the unspeakable: beauty and perfection. The language of florets is their school of study, of which they are extremely proficient. If you don’t wish to say any one thing and to, in truth, have it all, then these colorful buds are the answer. The patterns and detail on them reminds one of fine embroidery and silks: smooth, bejeweled and stunning. They will have anyone becoming a student and perhaps even worshiper of their foreign beauty, as if shipped from a far away land where only refinement and perfection exists. Treat yourself or surprise and overjoy some special someone with this rare sight. 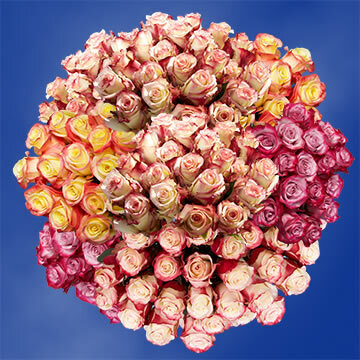 Multi Color Roses are sophistication itself. Their savoir faire will certainly impress, they are the symbol of tastefulness. You have our word of honor, only the best is acceptable and so that is all that we deliver.